In The Beguiled, Clint Eastwood has not only his strangest film but his most gynophobic film as well, to speak arbitrarily. 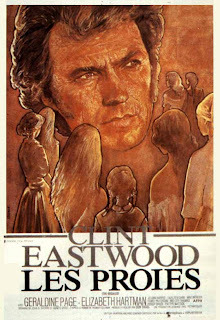 Filmed in 1971, the same year director Don Siegel would clasp Eastwood in for another role, one 'slightly' more iconic (Dirty Harry), The Beguiled is set in the South during the end of the Civil War and features Eastwood as a wounded Yankee discovered by an insubordinate little girl, disappearing off her "prim-and-proper" school grounds and into the forest. Lucky for him, the little girl played hooky to secure some mushrooms (what awful foreshadowing) because if it hadn't been for her, Eastwood's character McBee would have been left to die in that tree. Upon acting as crutch to his near-lifeless body back to the grounds, the girl brings him home to the strictly Southern bevvy of bells. 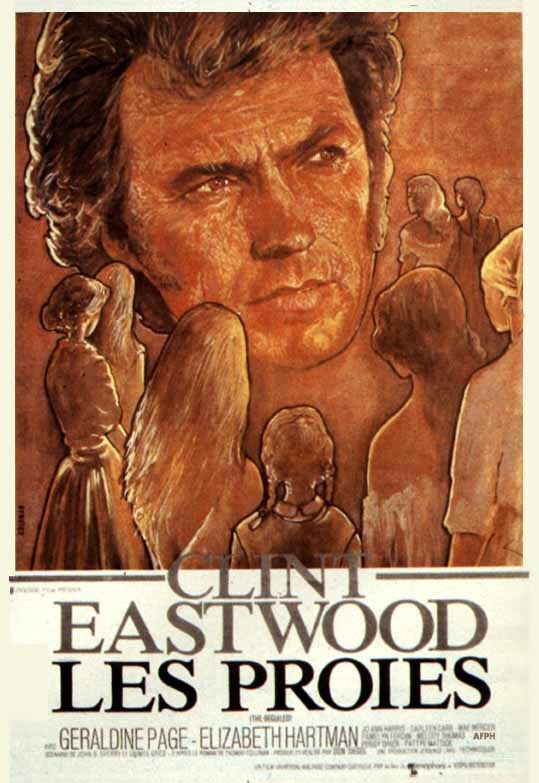 They are then sent into moral disarray as they weigh their options of either turning him over to Confederate hands or harboring a fugitive, albeit a handsome one, which leads into the sinister seduction and manipulation from the hands of Eastwood's. This also portends to future games of puppetry as Eastwood allegedly insisted that darling Sondra Locke get her tubes tied. A sad fate indeed as her daughters and daughter's daughters would have been done wonders for gene pools, with the right male instrumentation, of course. From here on out, The Beguiled slowly turns its head to reveal its noxious intent. The increasing jealousy and rivalries between the ladies ruminates and stews until The Beguiled cannot possibly contain such scorned women and instead of a suggested and respected output, the women unleash their spite and malice onto a victimized soldier. Now, before I go any further, I'd like to discuss what appears to be a large and inconclusive difference between the film adaptation and the source material Ala Thomas Cullinan's novel - originally titled A Painted Devil. 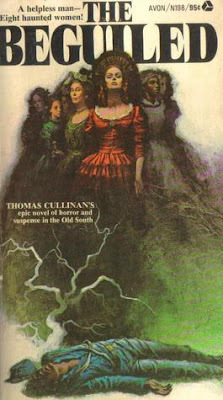 On one of many of the novel's illustrations of The Beguiled it reads "A helpless man-- Eight haunted women!" when, in fact, The Beguiled's cinema companion sympathizes with the repressed maidens of the estate and demonizes McBee as being a manipulator, "el seductor", and a callous male guilty of wartime savagery. Don Siegel makes for an interesting case to distort the original path sent down by the bygone succubi. In his own words, the film was to show "the basic desire of women to castrate men" but in his error to properly emulate the intended and initial game of female psychological warfare, Seigel himself near castrated the film by villainizing the victim. Regardless of the fact, although McBee regresses into a beastly nature after pampering the ladies fears with lies, The Beguiled still has the subversive matter-of-fact as to the inclinations of the deceitful women, all clawing for a piece of Yankee charm and sexual hospitality. 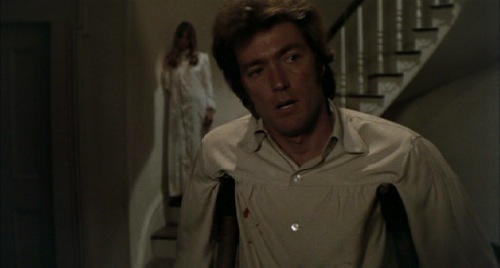 Demonstrated clearly is the wavering willpower of Eastwood's character McBee. Like most self-respecting males, only so much temptation can be endured before male virtues break and buckle. Mirroring the events of Misery, The Beguiled is essentially a hostage scenario. These conditions McBee is subjected to are the precursor for his eventual and eventful outburst in temporary violence. McBee begins the seduction of one female - a courteous friendship. This becomes an obstacle in the path of other women's intentions and desires which soon after almost results in capture from the enemy forces. 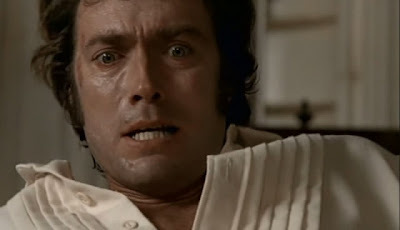 The Beguiled also marks a reflexive turn for Clint as the duration of the film is him chasing or fending off advances from females - quite a typical turn for one of the more charismatic and stoic actors of the twentieth century. Blending with McBee's pursuit of happiness are the pasts and traumas from several of the other girls. Mainly the sordid relationship between the headmistress, her absent brother, and the Negress slave-maid who recounts a particular night of botched sexual assault. It's not McBee's fault, the hen nest thrown into disarray - the pieces and mechanics of feminine deceit were there all along. The poor soldier only acted as a catalyst to a cat fight. The Beguiled then stumbles into a surrealism based in reality when something very dear is snatched from him, taken on what could be considered good judgment had the embers of betrayal hadn't been stirred. The Beguiled is a special sort of sinema, really. It holsters crude sentiments towards women but pockets them quickly before anyone notices. Elaborate fantasies are at play with the young soldier playing pawn. Diabolical pre-teens potent with hormones lash out after preemptive feelings of rejection with a nonexistent promise guiding them. 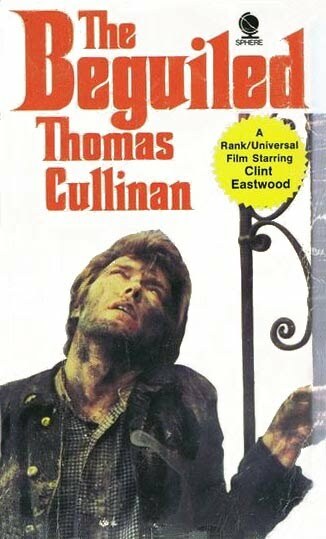 I doubt the original premise, rather, the prime objective of the novel, could have been duplicated if headed by one of the Western world's biggest stars while retaining the marquee value or the career in which Clint so dutifully balanced. So for this I appreciate The Beguiled, regardless of its off-the-beaten-path way of being rewritten. Clint Eastwood plays a certain kind of devil, one that is quick to be crucified by women for means of survival by seduction but these misguided firecrackers refuse to address the real issue here -- escape. The Beguiled doesn't bare a happy ending nor a real ending at all. In essence, it is just a continuation of strict regiment, a simple toss towards reform. The Beguiled isn't just important. It is really an eye-opener. The peculiar way in which it is filmed will leave you assuming McBee is just a monster, man at his most primitive. Perhaps even thirsty for vengeance but you couldn't be farther from the truth. He stood, he coped, he understood. Most importantly, he was grateful. And look where McBee wound up. The Beguiled stands adamant with a lesson to be learned. I just hope you weren't blind enough to miss it. Pamelyn: "but i thought you loved me Mr. Mcbee"
Clint: "And so i do Amy"
Pamelyn: "But she was all naked and..."
my knob up your sweet little 11 year-old arse-hole as well"